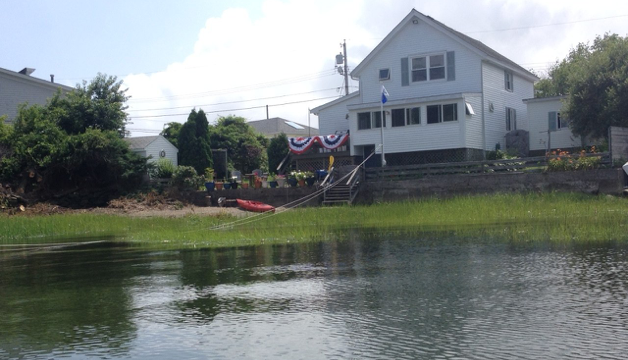 On the waterfront of Narragansett Bay, Cedar Cove Cottage offers weekly and nightly getaways, accessible by car, boat, or bicycle. Two separate apartment units of two bedrooms each, plus waterside deck, picnic pergola, fire pit, private yard, and private beach welcome families interested in the beach, boating, the outdoors, and life by the water. Located on the protected waters of Blue Bill Cove, Cedar Cove Cottage comes with kayaks, beach, boats, and steps down into the water. The surrounding Island Park community offers six restaurants, two large public beaches, three marinas and a playground, all within walking distance. Six minutes away in Bristol you’ll find a classic American town with museums, gourmet restaurants, and cultural activities. Eleven miles away is Newport with its mansions and yachting. You may check availability of the Beachside unit on the calendar. You may check availability of the Overlook unit on the calendar. Learn about our lodge in Vermont and our house in France.